Born in Bombay (Mumbai), Sharma came to the United States to study molecular genetics at the University of Cincinnati, before getting a a full-time research job at Georgetown University’s Department of Medicine. It proved fulfilling, but exhausting. To reinvigorate himself, he took to cooking his mother’s recipes and experimenting with Indian spices in everything from pasta to Greek omelets. Soon, his blog was born. When Sharma relocated to the Bay Area with his partner Michael and dog Snoopy, he decided to take a gamble. He left behind a career in the pharmaceutical industry to concentrate fully on cooking, writing and photography. 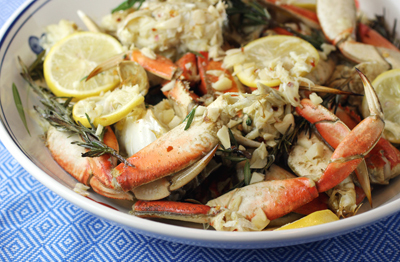 It paid off in spades with a cult following for his blog and now a best-selling cookbook. 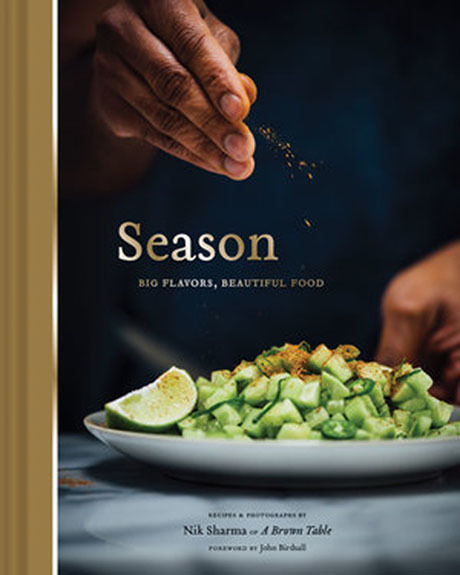 He has a way of combining Indian flavors in uncanny yet familiar ways that are delicious and not the least intimidating to try in your own kitchen. 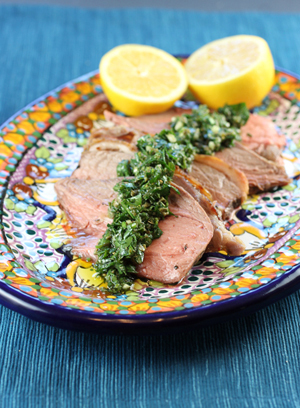 “Roast Leg of Lamb” is a centerpiece dish that impresses without being complicated in the least. 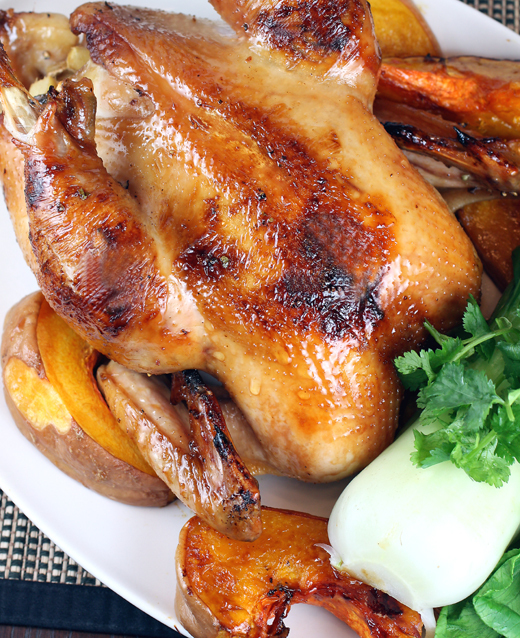 The blender does all the work of making the marinade. 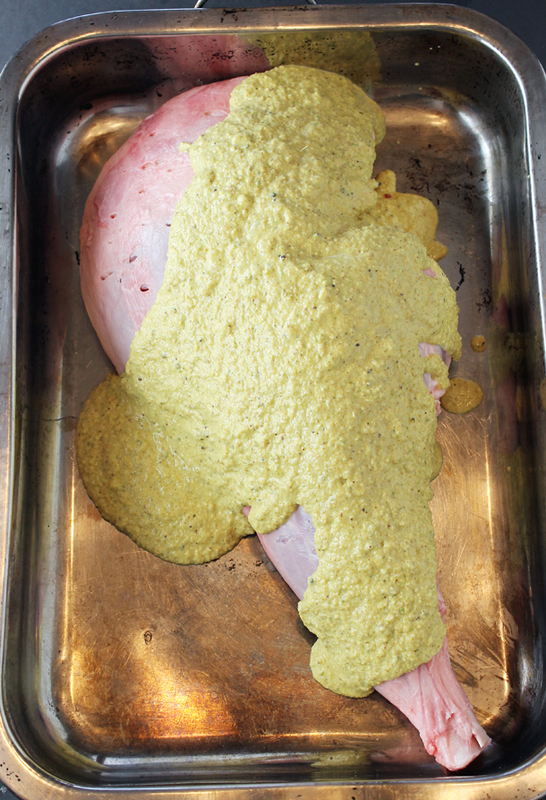 It’s slathered thickly on the leg of lamb. Sharma marinades it in a large sealed plastic bag in the fridge. I didn’t have one large enough to accommodate my leg of lamb, which was half a pound larger than the recipe called for. So I plunked the whole thing into a baking pan and covered it with foil instead, letting it marinade for 24 hours. Sharma instructs to roast it covered for at least 1 hour at 350 degrees, then 30 minutes uncovered, before increasing the heat to crust the top. However, my lamb was already registering close to 145 degrees (medium-rare) on an instant-read thermometer at that 90-minute mark, so I barely kept it in the oven after that when the recipe instructed to turn the heat up to 425 degrees to brown the exterior more. That’s why in the recipe below, I changed the timing a bit to indicate that you should leave the lamb to cook uncovered for 20 minutes instead of 30. I also found that the 1 cup of wine added to the bottom of the pan had dissipated after the lamb had cooked for only an hour. So that’s why I noted that you might need to add a splash more wine or even water when you uncover the pan and keep cooking the lamb. The fragrance from the lamb as it roasts is truly intoxicating, like a sweet curry that gets you salivating long before the meat is even done. A Christmas feast complete with a taste of India. The lamb emerges really juicy and tender. The marinade doesn’t penetrate as deeply as I would have thought. But when you get a bite of the meat with the spiced crust, it’s beyond divine with its unexpected burst of earthy-musky Indian spices that envelopes you in a warm cocoon. I think a light sprinkle of sea salt really brings it all together, so I added that to the recipe, as well. 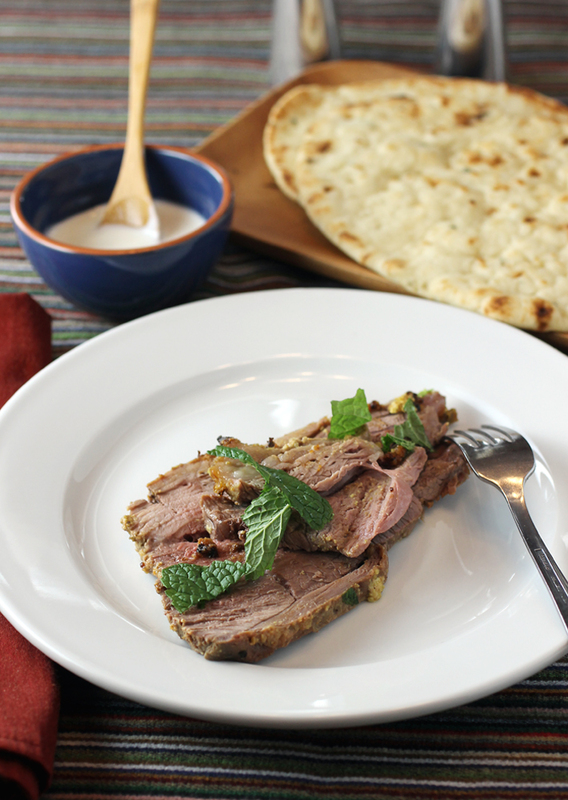 Sharma suggests serving slices of the lamb with a dollop of plain full-fat yogurt. 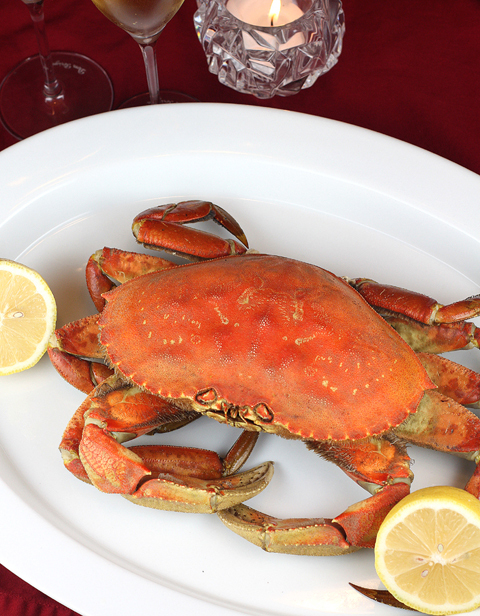 With its fresh tanginess, it’s the perfect accompaniment to the rich meat. And it makes for a grand new holiday tradition. 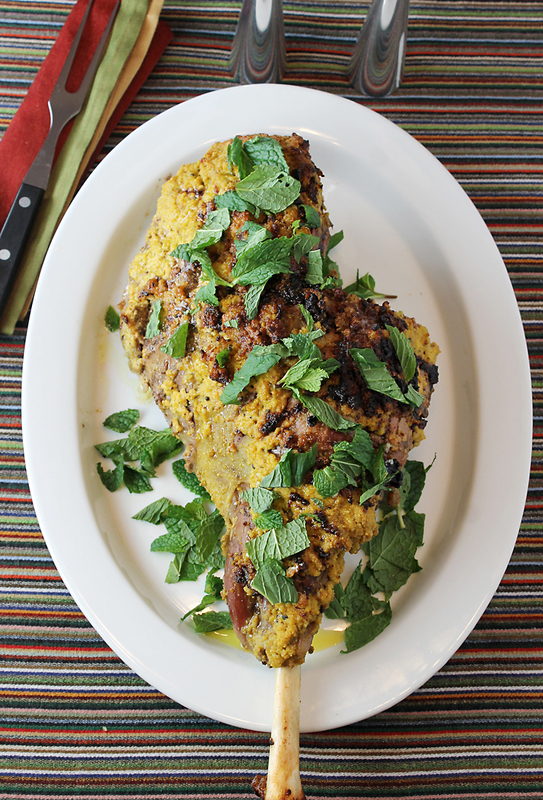 Roast leg of lamb with ginger, cardamom, turmeric and other fragrant spices. When ready to roast the lamb, preheat the oven to 350 degrees. 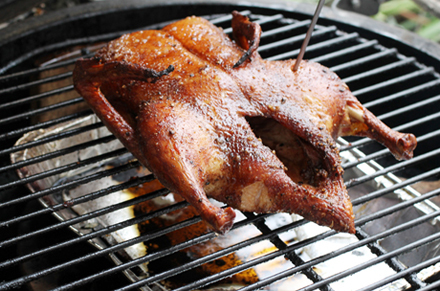 Grease a large roasting pan with a little vegetable oil. Put the lamb in the roasting pan and add the wine. Tent the pan with aluminum foil and roast the lamb for 1 hour. Remove the foil and return the pan to the oven for 20 minutes more, basting the lamb every 10 minutes with the pan juices. (Add a splash more wine or water if need be.) Increase the heat to 425 and roast the lamb until the meat starts to brown and the internal temperature registers 145 degrees for medium-rare, 16- degrees for medium, or 170 degrees for well-done on an instant-read thermometer, another 8 to 10 minutes. Remove the lamb from the oven and let it rest, covered with aluminum foil, for 10 minutes. 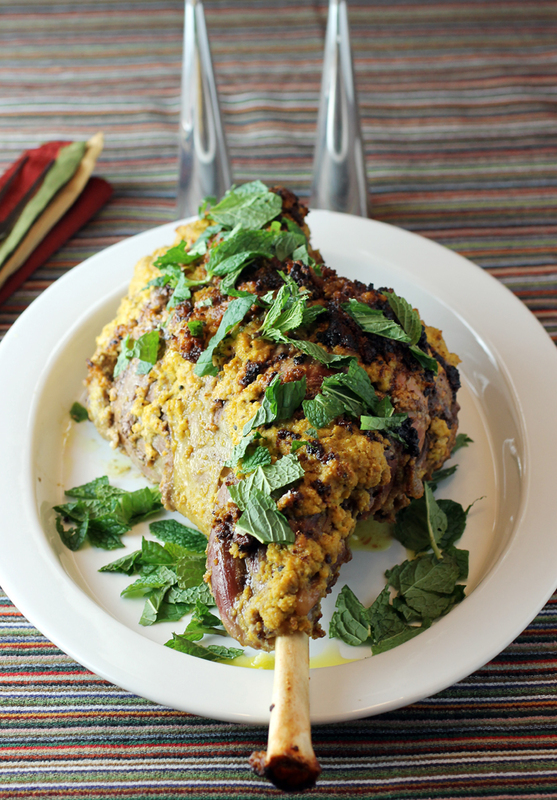 Transfer the hot lamb to a platter, drizzle with the melted ghee, and garnish with the mint leaves. Slice the lamb, sprinkle a little sea salt on the meat, and serve with a little plain yogurt, as well as rice, and naan or other flatbread.